The ErP Directive(Energy related Products) requires ever higher performance at lower energy consumption. Whilst the majority of the industry here is just looking to more cost-efficient motors, we at Nicotra Gebhardt are looking at the whole picture. 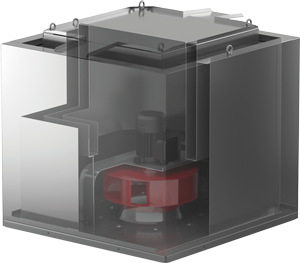 The impeller and housing design are specifically included in our concept in all our models. In the development, we now rely almost entirely on asynchronous internal rotor motors that are available worldwide. And for good reason: Fans with internal rotor motors are systemically superior to systems with external rotor motors. Systems that use external rotor motors have the disadvantage of the air flow of being cut off by the motor in the impeller. In addition, IE2 and IE3 standard motors exceed the traditional voltage controllable external rotor motors in terms of efficiency. The same applies to even higher motor efficiencies. Even an impeller driven by a PM internal rotor motor exceeds the energy efficiency of systems with EC external rotor motors. 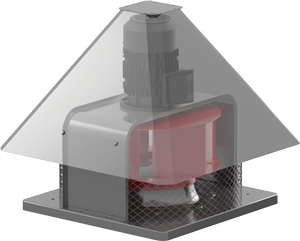 External frequency converters do not require a special filter for driving the roof fans. And even if a service is required, motors and frequency converters can be easily replaced in a few, simple steps. The genovent® can be fitted as easy as plug & play – even when exchanging an existing unit. 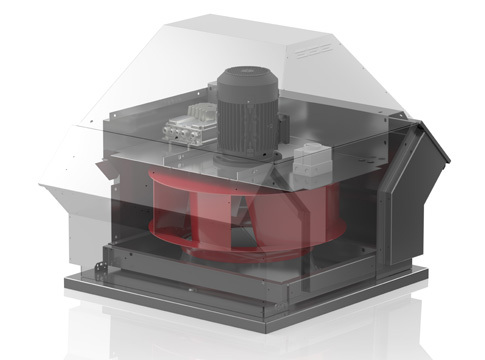 The intelligent design of the genovent® makes it possible to open the fan in a most simple and cost saving manner: Unscrew and ready! The back draught dampers protect the fan from intruding snow or rain, and prevents unnecessary heat losses of the duct system. This is built in, no extra back draught damper need be provided. A considerable throw of the vertically discharging genovent® protects the roof from dirt deposits and prevents air flow short circuits. 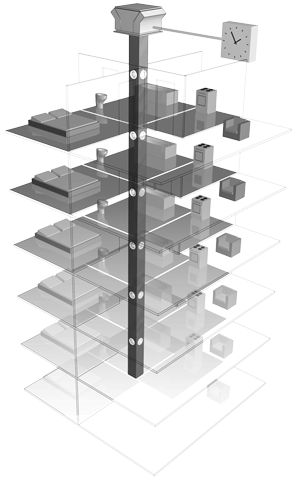 Flexible and exact modification to the required operating point lowers energy consumption. For the highest efficiency requirements, a PM motor in accordance with IE4 is also available in the RDME. In addition, variants with an integrated frequency converter are configurable. Thanks to the structural separation of the motor from the exhaust air, variants with up to 120 degrees media temperature are available for special requirements, such as transporting exhaust air from kitchens. The unique motor-impeller-housing unit of the EVO series is harmonised in every detail and ensures the highest possible efficiency. This reduces decisive costs, also those over and above incurred during the period it is operating. 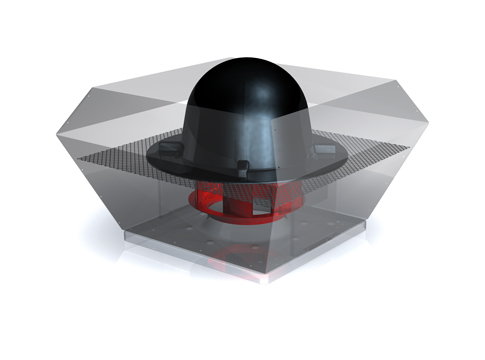 Despite its simply excellent efficiency the RVMEVO has the same basic measurements and operating data as those of earlier models in the Nicotra Gebhardt roof extract units programme. It can therefore be easily and quickly integrated into existing assembly equipment which saves time and money. The quiet one: One welcome side effect of the new EVO and housing technology is reduction of the sound level generated – without additional sound insulation. 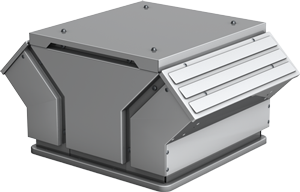 There are cases where a fan has to be silent first: It is for cases like this that the FDM F1 has been designed. 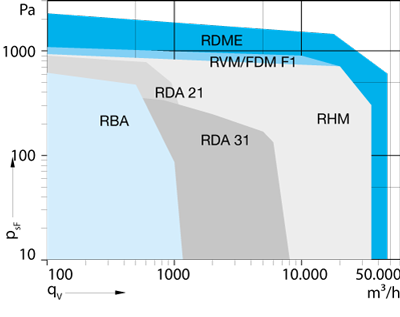 A wide programme of standard motors. Planners often tender for roof fans with a horizontal blow-out direction due to structural conditions. The maintenance friendly RHM is the price-effective alternative precisely for this application. 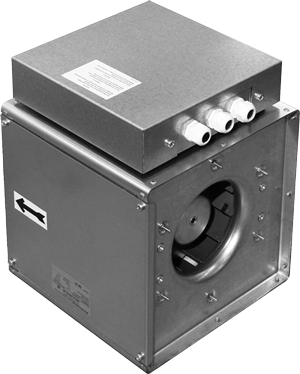 The RHM is fitted with an IE2 asynchronous three-phase motor. Simple filterless control by means of external frequency converters or retrofit electronic voltage regulators in defined models. Anti vibration mounts guarantee extra low vibration level. The high performance impeller with backward curved blades enables particular smooth running. Thanks to its low housing losses, it achieves impressively high efficiencies. A full range of accessories completes the RHM offer. The RDA genovent®: Also with integrated pressure regulation or time switch module for DIN 18017-3 and DIN 1946-6 applications. inspection work on the roof would not be possible or would be simply too complicated. This is a ventilation system built according to DIN 18017 Part 3 Section 2.2.1; a central ventilation system with overall flow volumes which can only be changed together. This is a ventilation system built according to DIN 18017 Part 3 Section 2.2.2; a central ventilation system with overall flow volumes which can only be changed for each apartment.